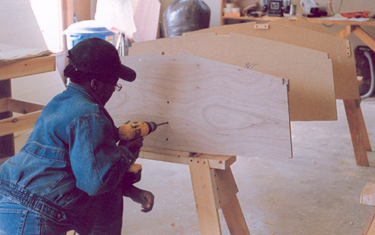 marine plywood, and more for the backyard boatbuilder, for sailboats, powerboats and rowboats. WELCOME TO ARCH DAVIS DESIGN!. 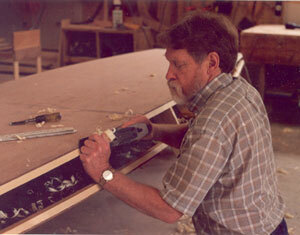 I’m Arch Davis – I learned boatbuilding and design in New Zealand in the 1970s. 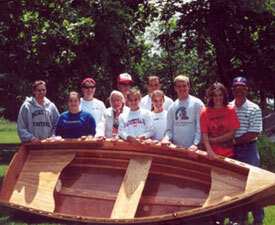 I have been helping people to build beautiful wooden boats since 1988. You can see a few of them by clicking on Picture Gallery. My approach to design is to put into your hands the means to use modern materials – marine plywood and epoxy resin – to build a truly lovely boat with classic lines. 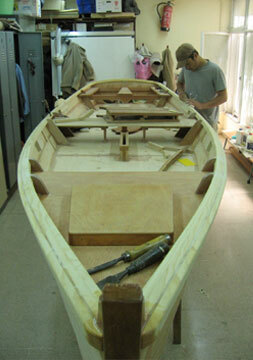 I believe that a boat should be beautiful, not just by virtue of her lines, but also in her construction. No material makes this possible like wood. My aim is to take advantage of wood’s unique strengths, in a structure that captivates the eye. 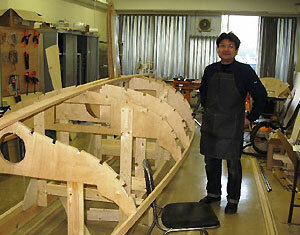 I want you to feel that you are always doing good work in building one of these boats. You’ll see that I have a small collection of designs. That is because I understand your need for clear, comprehensible, detailed plans and instructions. I put a lot of time into my drawings, building manuals and DVDs. I also spend a lot of time helping people through their projects, on the phone or by e-mail. I really am here to help! You won’t see promises here that building a boat is quick and easy. What I do promise is that building one of my boats will be an extremely rewarding and satisfying experience, and that you will be enormously proud of the finished result. Can you build one of these boats? Certainly – some of them, the Sand Dollar, or Laughing Gull, for example, are entry-level designs. Others – the Penobscot 14 or Penobscot 17, or one of the bigger boats – are more challenging. Many have been built by people with no prior woodworking experience at all. Others have found stitch and glue a little unsatisfying, and want to try their hand at something that makes better use of their woodworking skills. All my plans include clear, detailed building manuals, and my personal back up, when you need it. Just don’t build one of my boats unless you are willing to show her off, wherever you take her! If you see something that you like in my collection, please feel free to contact me with any questions. I am available on the phone at 207-930-9873, or email me at archdavis@gmail.com. I believe that one of life’s great moments is landing on an island in a boat of one’s own building. I hope you will share the experience! 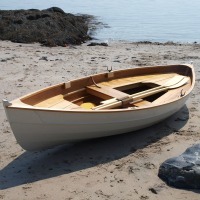 Grace's Tender - More than just a tender, this little dinghy is a fine vessel in her own right. She is a pleasure to row, and sprightly under her simple sailing rig - a great boat for youngsters to mess about in. 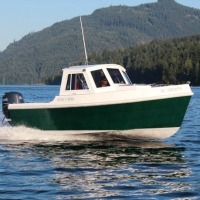 Bay Pilot 18 - an 18 ft pilothouse cruiser for outboard power. Laughing Gull - 16 ft self-bailing sailing/rowing skiff. Penobscot 13 - 13 ft little sister to Penobscot 14. 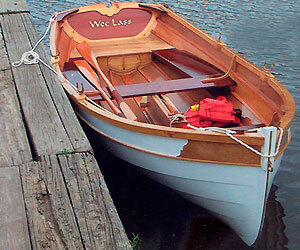 Penobscot 14 - 14 ft glued lapstrake sailing/rowing skiff. Sand Dollar - 11 ft sailing/rowing skiff. I have kits for a number of my designs, ranging from frame kits for the Sand Dollar, Penobscot 14 and Penobscot 17, to a complete kit for the Grace's Tender. 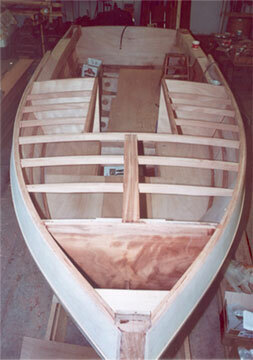 The pre-cut kit for the Laughing Gull provides all the plywood parts and hull framing, cut to shape. 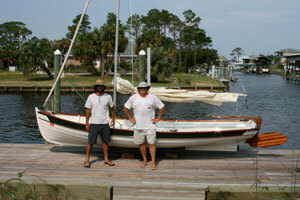 I also have epoxy kits and plywood packages for all my designs, plus sails, rigging, and numerous other items. Here's my daughter, Grace, setting up the frames for a Grace's Tender kit. My two week class “Building the Penobscot 13” at the WoodenBoat School in Brooklin, Maine, is one of the highlights of my summer, and has been very well reviewed by students. The school on beautiful Eggemoggin Reach is a great place to spend some time. You get the chance to see a variety of activities, there is a fleet of small wooden boats that are available to students in the evenings and on weekends, and the food is great!